As the Skids embark on the first dates of their UK 40th anniversary tour this week, arriving in Edinburgh tomorrow, it is fitting that I have spent the last week speaking to an array of journalists, photographers, promoters and musicians in preparation for the History of Scottish Music Centre’s first exhibition in June at the Fruitmarket Gallery. Folk could not have been more helpful and every contact recommends more people who may have their own archive or story to tell. Some are still based in Edinburgh or Glasgow but no matter where people are in the world now they are keen to help and get involved. Some are still in the music industry and many have gone on to other careers but all remember those earlier times fondly. 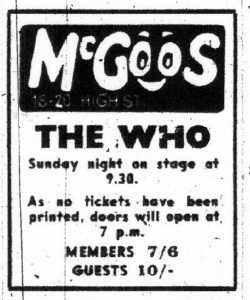 I’ve been concentrating recently on the times before Avalanche opened in 1984 starting in the middle with punk and then working forwards to post-punk and backwards to bands like the Sensational Alex Harvey Band and venues like McGoos on the High Street that played host to The Who – just turn up at the door, no tickets! When just one fairly minor band, the Dreamboys, can spawn Doctor Who and a famous American chat show host (Peter Capaldi and Craig Ferguson) it is hard to argue against the fact that there was an abundance of talent among all the bands from that era. And of course it didn’t stop there with any number of bands making their mark in the 80s from The Shop Assistants and the Pastels to the Jesus and Mary Chain and Teenage Fanclub. What is maybe lost on today’s bands is what an important part those around the bands of the day played. Glenn Gibson was the first journalist to get Postcard Records bands in the NME and then a little later in The Face closely followed by the writer Kirsty McNeill and photographer Robert Sharp who followed Glenn to the NME after the success of the fanzine The 10 Commandments. Simon Clegg who now lives in Australia still has his photographs used today and often his photos of people at the gigs are as interesting and popular as the ones of bands. Anyway more of this another time. Fast forward to today – see what I did there? 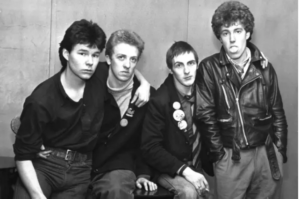 – and Skids are back to remind everybody that Fife produced its fair share of bands during that time if not a stand out label. Having said that one of the best fanzines of the time Deadbeat was based there. If you haven’t got a ticket for the Edinburgh gig I’m afraid it is sold out though it never does any harm to check with the venue, the Liquid Room. As I type this there are only a few tickets left for their other imminent Scottish gigs. Not everybody would agree but by the high standards of the past things are fairly quiet for new Scottish bands at the moment and it is to be hoped that when the time comes, as it inevitably will, we still have the venues and the ability to make the most of it. The Skids play in Scotland at PJ Molloys, Dunfermline, tonight; the Liquid Room in Edinburgh tomorrow; ABC, Glasgow, 6 May; Montrose Town Hall, 29 June; Glen Pavilion, Dunfermline, 30 June; Inverness Ironworks, 4 October and Beat Generator, Dundee, 5 October as part of a 30 date UK tour. Where is our city’s Hydro? According to Wikipedia the SSE Hydro handled 751,487 ticket sales in 2016, making it the eighth-busiest music arena in the world in terms of ticket sales. While I personally would not enjoy seeing any artist in an arena of that size – the Hydro holds 13,000 – there is no doubt that the citizens of Edinburgh would very much like to see an arena with that capacity be built. I’m not sure exactly where would be the best place for such a building and while nobody would suggest Edinburgh Council should be too involved in such a venture I do think it would be wise for the council to actively encourage it and, assuming it can be agreed on what it looks like, give the good folk of Edinburgh something they actually want.